Snow is one of those things that we see from a distance here in the south. Yes, we do get snow in Charleston, but it is such a rare occurrence that I can think of every time it snowed here in my mind. We have hurricanes about as often. So, not an ongoing yearly happening for us. It seems that the I-95 corridor is a huge deterrent for any snow that might try and make its way to the Lowcountry. The weatherman seems to almost always say, "Snow will make it to I-95, but not much farther." It seems the snow is as scared of those crazy New York drivers as I am. So, down south, we really don't know much about snow. But I do have some experience with snow. I haved lived in Greer, SC, Rocky Mount, NC, and Lynchburg, VA. I learned to drive in the snow. Work in the snow. Go to school in the snow. Play in the snow. One thing I learn is that snow is sticky. 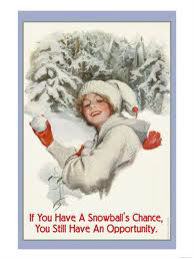 If you roll a small ball of snow, it will pick up more and more as long as you roll it. I learned this incredible skill when trying to make a snow man with the kids. We started with a small amount of snow not much more than what we could hold in our hand then rolled it around the yard until it got to the size of a large beach ball. It made a GREAT base for a large snowman. From small beginnings, large things can come to pass. It is no different with our debt. Most of us have made enough money in the past to do what Dave Ramsey calls, "outspending our stupidity." In other words, we had enough income to pay for our impulse buys, our restaurant splurges, our exotic vacations, our brand new cars, and our oversized homes and were still able to stay close to the black. Now, many of us have no way to cover those costs anymore. So, we wound up in debt. 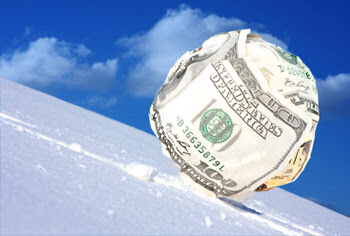 That's where the debt snowball comes in. 1. STOP CHARGING or GETTING LOANS on anything. 2. Begin to pay minimums on every debt you have. 3. Quit eating out, buying that daily cup of coffee, or find an alternate income stream like pizza delivery or another part time job that can get you $100 to $200 extra income a month. Please don't spend money to make money at this point. You can't spend your way out of debt. 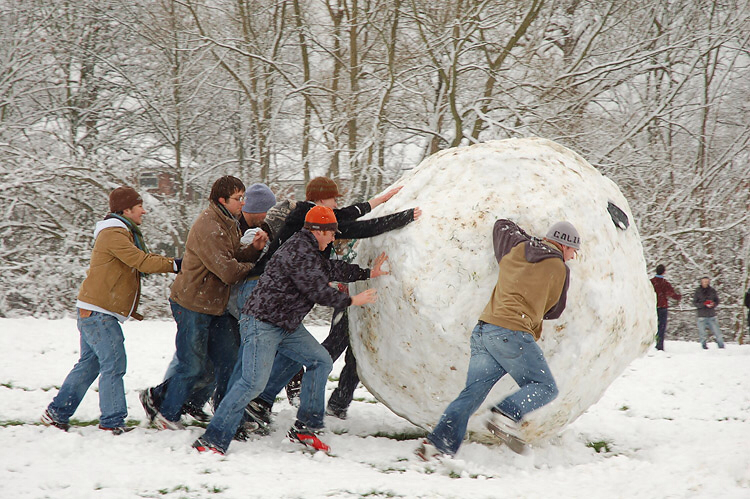 You might just need to quit your impulse buying to get the extra to apply to your snowball. Do what ever you can to get that extra money on a monthly basis. 4. List your debts, smallest to largest. similar to the photo above. You can get an online version at www.JoeSangl.com/tools. 5. Lastly, start with the smallest debt (not the one with the largest interest), use the $200 extra, and pay it off first. As many months as it takes to do that pay until it's finished. Now, you're on your way. Then you're ready to go on to the next debt, apply the minimum payment, add that to the same $200 plus the minimum payment you were paying on the first debt. Pay it off, then do the same thing with the third smallest adding it all to the next debt until it's paid off. The payment gets larger every time. Here's how it works. Let's say you have a combined debt, excluding your home mortgage, of $41,000. This would include cars, school loans, credit cards, what you owe family, and anything else you owe other than your living expenses. 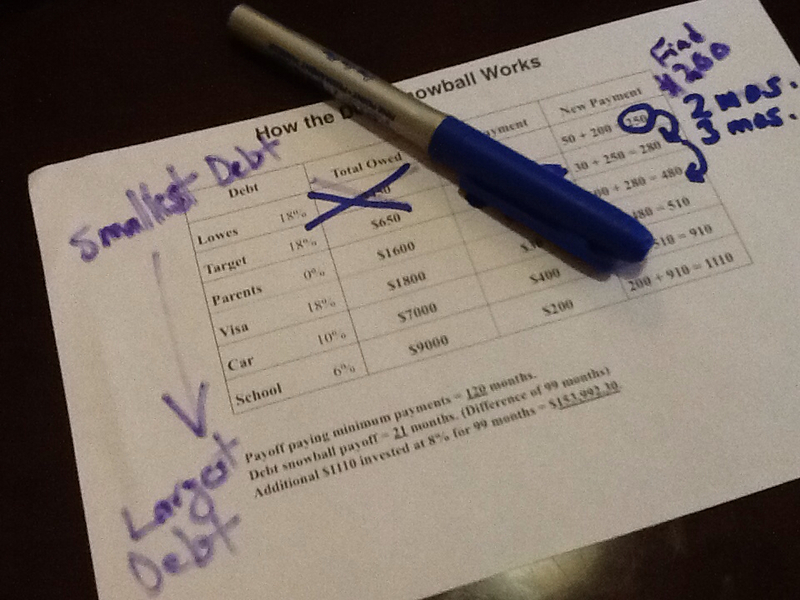 using this method of paying debt, it will take 65 months to pay them off. And that's by only using $200 extra a month! Now, the alternative is paying for 30 years, and paying 10 times what you owe. Not a pretty picture. My challenge to you is to beat this thing. Refuse to take anymore beatings from the bullies of the finance world. You are going to have to discipline yourself to live like no one else, so you can live like no one else in 4 to 5 years. Letting money serve you rather than serving money. When that happens, we can use our money to serve God. Can you imagine the impact you can make for your family with the extra money? Can you imagine investing and saving with the extra and retiring without anxiety? Can you imagine impacting our world by building wells, feeding the hungry, and adopting orphans? Can you imagine the resources you can purchase? missionaries you can support? Lives that can be changed with the money that will be available to now serve the Lord as money serves you? This is the kind of snowball that does have a chance. You can do it! Join us this week at Oceanside Church for the "Strapped" sermon series at 10:30 a.m. See you there! If you need a video explanation that will explain it better, here's Craig Groeshel with one of the best explanations I have ever heard. Super Bowl Party - Sunday Night, Feburary 3rd. Begins at 6 p.m. at Oceanside. Bring your best tailgate food. Wear your team's colors. Enjoy the food. Let's have some together! Valentine's Not Just for Couples Banquet - Sunday night, February 10th 7p.m. Games, Dinner, Even pictures for $5. RVGC Video Game competition - 6 p.m. Friday Night February 22. $5 for Super Smash Brothers Competition. $75 grand prize. Total purse to be awarded, $150.